I will never say that parsnips are my favorite vegetable but I have learned to enjoy eating them. 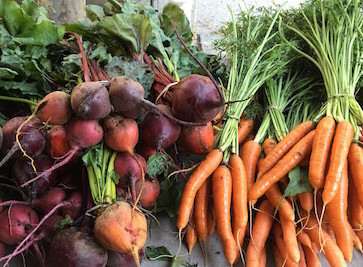 They are inexpensive compared with greens, even the organic ones – and we should be buying organic when we buy roots because washing doesn’t remove many pesticides. 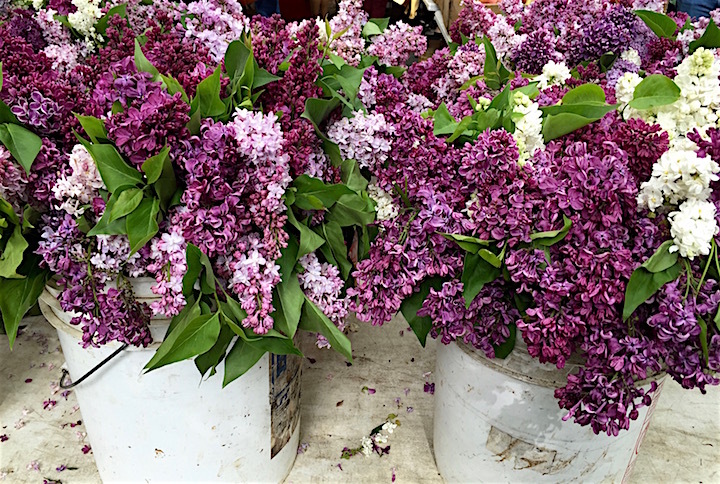 Also, when roots are organically grown, you don’t have to peel them and there are nutrients in the skins. Plus, they are one more vegetable available to us in winter. 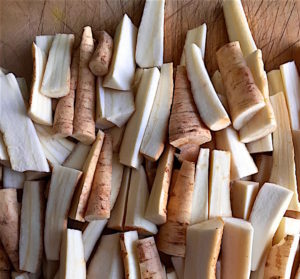 Parsnips have a strong but sweet flavor, less cabbage-y than turnips, but also less sugary than beets. 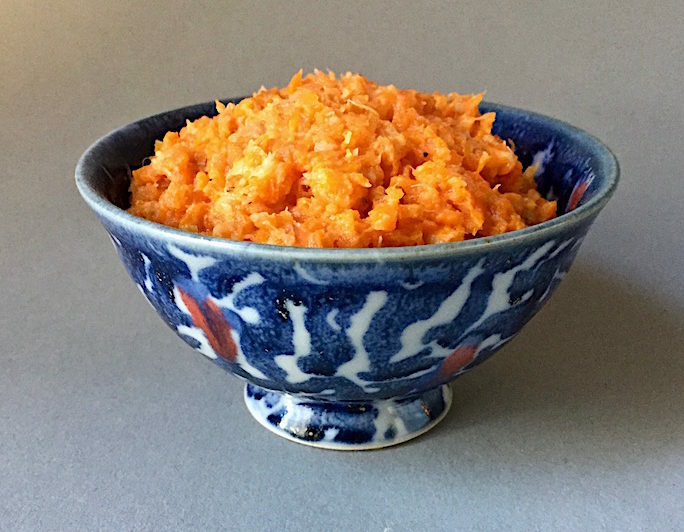 Raw parsnip adds another layer of flavor when shredded into a beet or carrot salad. One very tasty way to eat them is cooked and mashed with carrots (1 parsnip for every 2 carrots) with a little butter and salt and pepper. Parsnips can be mashed or pureed alone with a little butter or olive oil or mashed along with potatoes (and celery root) to lighten them up. For those who like things richer, there are versions with cream and nutmeg. 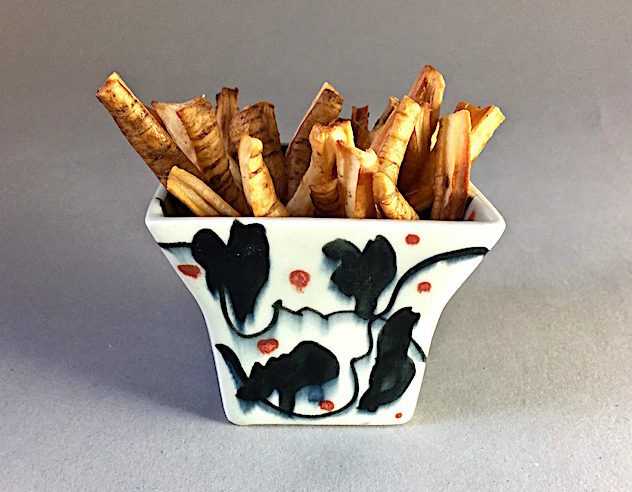 If you make vegetable chips, either by baking or frying, try including parsnips. Cream of parsnip soup, with roasted chestnuts is delicious but a bit more work. 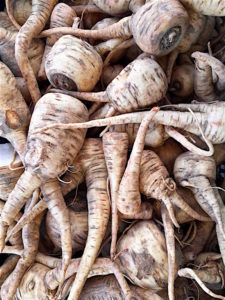 I often add a small parsnip (or half if they are large) to a pot of chicken or vegetable stock to enrich the flavor but be careful of the amount because parsnips, like turnip and cabbage, can overwhelm the flavor. A little goes a long way. Aside from mashed with carrots, my favorite way to eat them is simply roasted, preferably with a little maple syrup, which helps caramelizes them. If you have lots of vegetables (like carrots, beets, sweet potatoes, celery root, potatoes, etc.) to roast, you can just add some sliced parsnips along with the rest. But if you want to cook them alone, roasting is the way to go. Slice the parsnips and mound on a rimmed cookie sheet or roasting pan. Mix oil and maple syrup together and drizzle over parsnips, sprinkle with a big pinch of salt and toss. Spread pieces out flat on the pan and roast in a 400 degree oven for 30-40 minutes, flipping halfway through cooking, but watch to make sure they don’t burn. Ovens all cook differently.